I downloaded Mockingjay at 12:23am the day of the release. In my pajamas. And I lent my copy of The Forest of Hands and Teeth to my niece in Wisconsin, without having to pay shipping. We chatted about it on Facebook (also Mockingjay. All her friends were Team Gale, so I gave her Team Peeta support). It’s small things like these, and big things like saving money on lower e-book prices, that make e-books full of win. 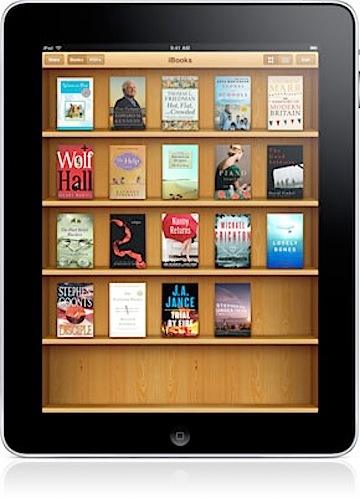 A Wall Street Journal article reports 40% of e-reader owners read more than they did before owning an e-reader, and buy 3.3 times as many books. THREE times as many books! That, my friends, is the salvation of the publishing industry I’ve been talking about. Should you jump into the e-reader frenzy now? That’s a decision between you and your pocketbook, but you may want to wait, as prices and options change at a dizzying pace. I’ve been telling friends and family to hold off for the Holiday electronic gadget rush, when supppliers are likely to put forth their best offerings. Nathan Bransford has a still timely primer on the e-revolution, if you’re timid about dipping your toes in the water. But I was surprised how many people I know who have already jumped in with both feet: our soccer coach, who charges his Kindle off his laptop on long business trips; my niece in Wisconsin (above), where the whole family got their own Nooks; my hairdresser with a gorgeous iPad that makes me drool with envy (she uses it for school). Of course, e-books and e-readers have problems. I occasionally forget to recharge, which is annoying when I want to read right now. I’m one of those people who lurks and peeks over your shoulder to see what you’re reading, which is really impossible with an e-reader without having the cops called on you. ** And of course there’s compatibility issues with readers and formats, but I expect that to all settle out in the coming years. While e-readers may be carrying us into the future, this doesn’t mean the e-pocalypse is near. In fact, I think e-readers will soon be considered an obvious (in retrospect) next step in the constant forward march of progress (if you don’t believe me, see this hidden link between e-readers and sheep). This future is so bright, I need sunglasses. What's exciting about it is that hopefully more people will read. Altho I think many of the nonreaders are playing cool games on their ipads not reading books. It's the Kindlers who are the big readers right now. @KarenG I think having gadgets has energized people who were already readers to read more – and maybe enticed a few to pick up their lapsed habit. I hope! I love my printed books. I love my bookstores. I'm torn. My husband pointed to my son on his iTouch, and said, "To his generation, ebooks will be the natural progression." I still love the print book, and the bookstore, and always will. But e-books ARE in. I have a Nook, though with the prices coming down, I wish now that I had waited until the holidays. @Theresa Sometimes change is a generational thing, but I think this will come even faster. @Catherine Good for you! I'll give you two years! 🙂 And I don't think print books will become obsolete. I still buy them (and often) even with the Nook. In fact, I vasciallated just recently whether to go paper or e-book for a book on writing. Ended up with the e-book, but it was a close call. @Ann I figure any tech has a relatively short shelf life (2-5 years depending). Even though some new shiny versions are coming, I'll stick with the Nook for a while – mostly because my friends and family have one, and I like to share! I am excited about e-books! I don't think I'll ever give up real books, but I do want an e-reader. I'm in the "wait til there are more/cheaper options" camp…and the "I'm too poor right now" camp, lol. All ways to celebrate "Story"
Funny this should be the post when I checked in here today. My 11 year old spent his birthday money and the rest of his life savings on a Nook over the weekend. He's thrilled with it! He can't wait to finish the paperback version of Inkspells he's reading so he can move on to e-books. He already announced that I will not need to order any more books from Scholastic when they come home. Hmm. Wonder how Scholastic will deal with that sentiment as more youngsters take this step. I did try to convince Neal (my son) to wait until Christmas in case there were better deals to be had, but his money was burning a hole in his pocket. He went with Nook over Kindle for various reasons incude the touch screen and the epub-ability of it. He's already downloaded a waiting list of classics to read for free, including Thomas Paine's "An American Crisis." Yes, my son is not your normal 11 year old, nonetheless, I see more kids moving in this direction. My 13 year old daughter already has her eye on an ipod touch so she can read, listen to music, and mess around with apps all in one place. @Sharon The environmental engineer in me questions the assumption that a metal-heavy-costly-to-produce e-reader device would be better for the environment than paper books. Paper is, after all renewable, whereas most materials in e-readers are not. However, there are also chlorine emissions involved in paper production, which can be a nasty source of air emissions. And there's all those fossil fuels burnt in transporting paper books (both ways, for returns). And then some publishers BURN remanded books (that should be a crime for so many reasons, not least environmental). People like to compare carbon footprint (mostly because it's easy to wrap your head around), but I think it makes more sense to think renewable vs. non-renewable, and real-pollutants vs. maybe-global-warming-impact. OK, sorry, diverging into an enviro-engineering rant. In short, I doubt e-readers are better, but I'd be open to seeing proof. I don't think the e-pocalypse (in which paper books are gone and all we have left are digital) will happen in our lifetime, but even if it did, I don't think we'd miss paper books as much as we think we would. We read books for the stories, after all, not the paper smell and page turning. The only two reasons I'm still holding out on an e-reader are price (that's a big one; and I'd have to get someone to bring it to me from America) and ability to share books (scads of people borrow my books, but only one owns a Kindle). I won my Kindle or I probably wouldn't have spent the money, but I did download Mockingjay at about 1:30 am because I couldn't wait for the book store to open 🙂 Little by little I'm reading more books on there, including yours! But I still like my paper copies better. I have quickly realized that e-readers for kids come with many topics ripe for discussion on blogs like yours. For example, I had to connect my credit card number to Neal's account and hope that he doesn't buy anything without asking. Plus, when browsing books using wifi, there are no age filters, so he can read summaries of any book he wants, no matter how adult it may be. I suppose that's not different than what we deal with with an ipod. It just feels more worrisome for me personally than an itunes account does. As an aside, I asked at my local library about borrowing ebooks. I know some libraries do that, but couldn't find mention of it on their website. The librarian tried to help figure it out, but I had to educate her on what an e-reader was first and why an audio book wouldn't work on it. That seemed wrong. If you're in the book business in any capacity, it seems like you should have at least heard of a Kindle and Nook, doesn't it? In the end we found a very small selection of books that looked like you might be able to borrow them from the library, but they were all books you could get for free from epub anyway. I'm not used to being a guinea pig for new(ish) technology! Neal was aghast too. He's been wanting an e-reader for about a year, so he couldn't fathom not knowing what one was. @LTM I don't think paper is going the way of the dodo … yet. I'm still buying paper, even with my enthusiasm for the nook (but not always voluntarily). Also, there are libraries that are essentially "national" e-lenders. I may have to dig out more info and do a post on that. And I'm with Neal – I'm aghast that the librarian doesn't know more about e-readers. Yo! There's like millions of people with these things! I hope books don't go away! I love paper books! Reading online seriously bothers me.